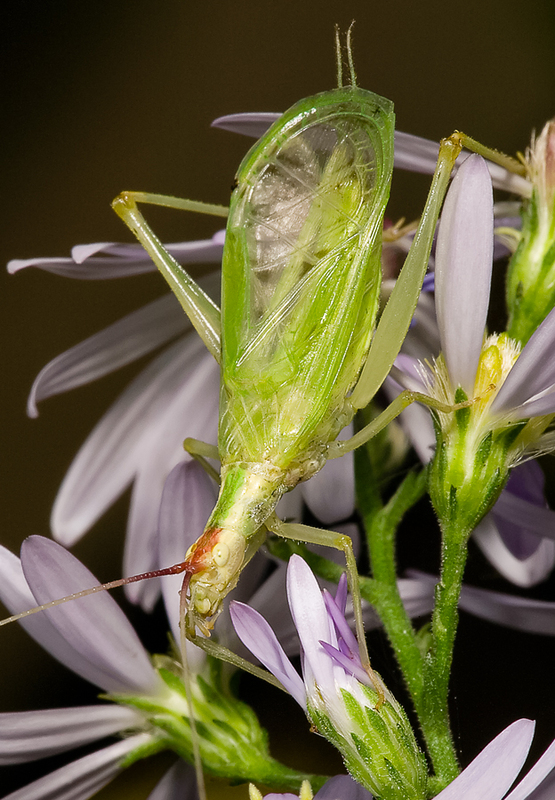 Song of a Broad-winged Tree Cricket (scroll down for explanation and additional recordings!). Named for its elegant, wide wings, the Broad-winged Tree Cricket sounds off in fields of coarse weeds from August through first frost. Favorite plants include goldenrod and bramble. A pleasing visual mix of cream-colored body and legs, light green wings, and reddish accents on the head and the base of the antennae combine to make this tree cricket stand out. Males sing from perches where they are able to use the surrounding vegetation to augment and direct their songs. They are often found low in the vegetation in the crotch of overlapping leaves, or else singing from a hole they have chewed in a leaf. Song: Perhaps the loudest of the tree crickets. Males can be heard from 200 feet away or more. Songs are pure-toned continuous trills that are rarely interrupted, with a main frequency of about 3 kHz and a pulse rate of about 25 per second. Males sing mostly at night, but after a light frost later in the season, they will sing early in the evening before the sunset. Sonogram of a Broad-winged Tree Cricket. © Wil Hershberger.